Signs in the sidewalk in Todoroki pointed us to the park. The entrance was just a short walk from Todoroki station in the Setagaya ward. Tuesday morning, Brett and I set out on a mystery outing. I had read about Todoroki Ravine Park in Super Cheap Tokyo and thought it sounded like a place both Brett and I would like to visit. I kept the destination a surprise from Brett, so when we started out in the morning he had no idea where we were going, and because I’d never been either it was a mystery to me as well. All I knew in advance was how to get there. At our station change, we spied the top of Mt. 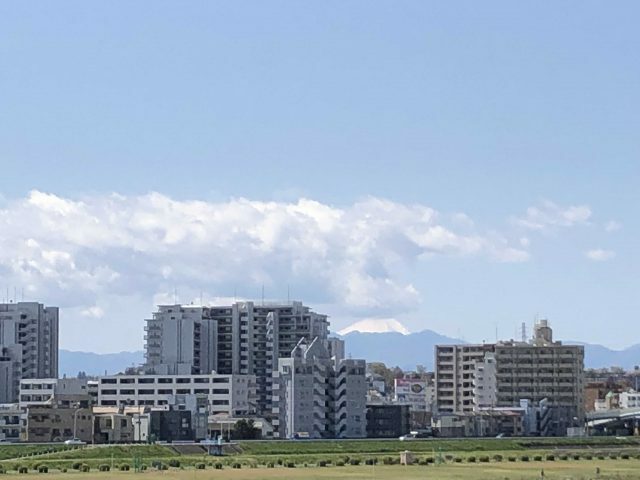 Fuji poking up in the background between the buildings. 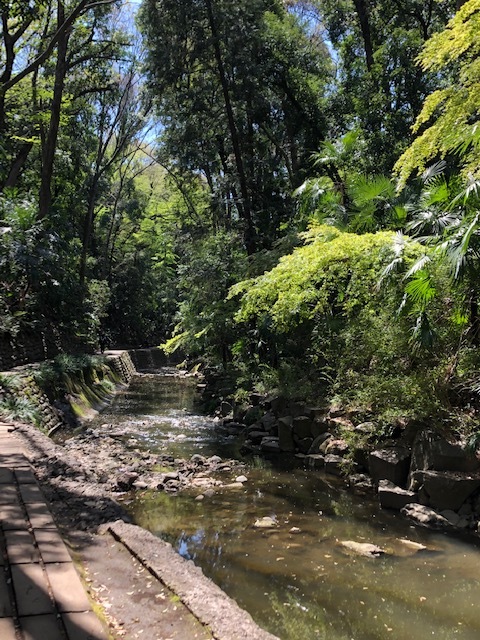 As I’ve said before, Tokyo often appears to be nothing more than a mass of concrete, but throughout the city there are wonderful parks where one can immerse themselves in nature and forget they’re in a city of over nine million people. Todoroki Ravine Park took that experience to a new level. Heading down into the valley, the sound of rushing water overtakes city noises. Looking back at Golf Bridge and its reflection. The bridge was named for a former golf course that spanned the valley in the early 20th century. Lacy Japanese maples among the spring greenery. 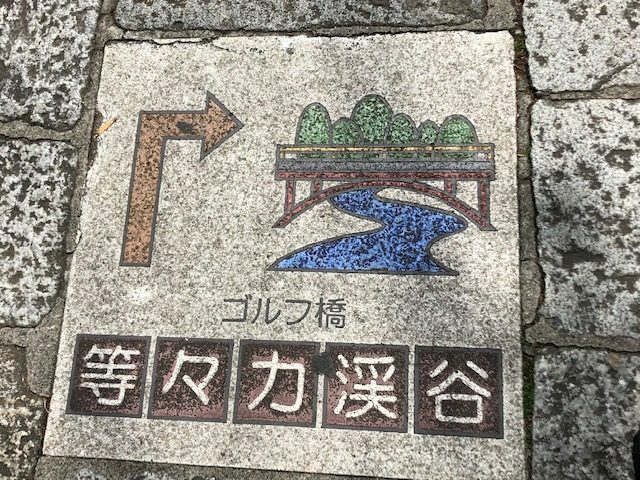 The ravine is the only natural valley in the 23 wards that make up the Tokyo metropolis, cut by the Yazawa river on its way to join the larger Tama River. 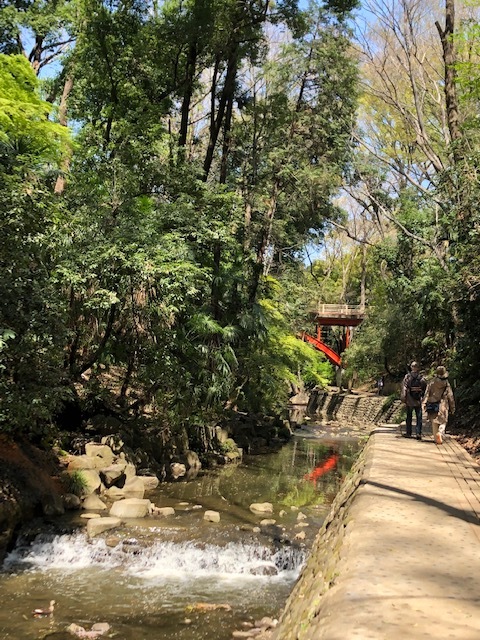 Unlike most parks in the Tokyo area, the ravine has mostly been left untamed, and it’s filled with giant trees, bamboo and other plants, with the river rushing through the center. As we descended into the park, we noticed the air became cooler and the river drowned out the noise of the city. We were immersed in nothing more than the sounds of nature. 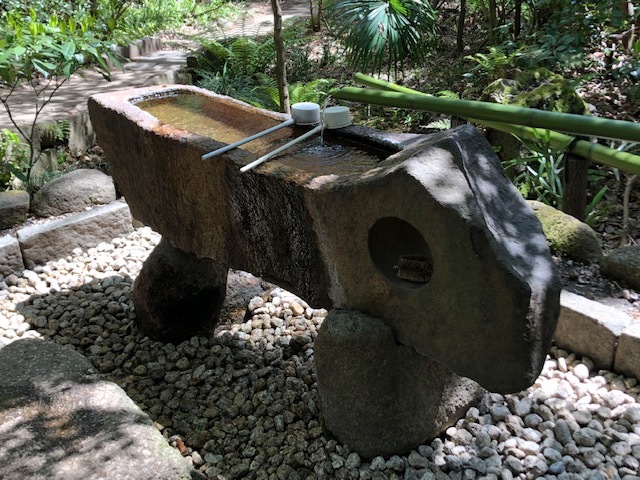 This hand-carved water purification basin marked the entrance to a small temple in the park. 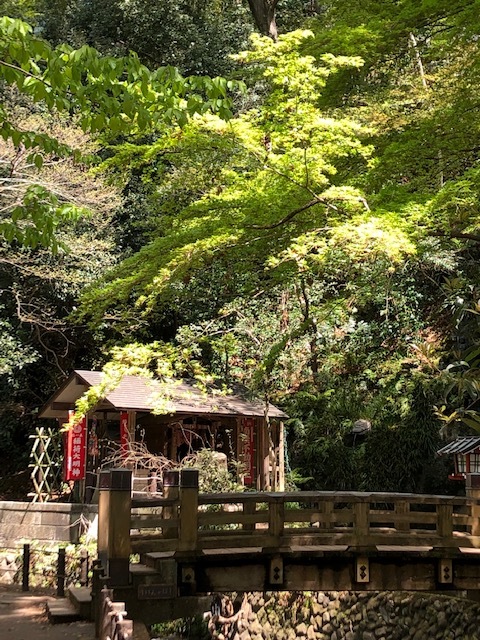 Across the river was another small shrine, Chiego Daishi Mieido. Behind this shrine is the Fudo Waterfall, now very small but formerly used for ascetic training. 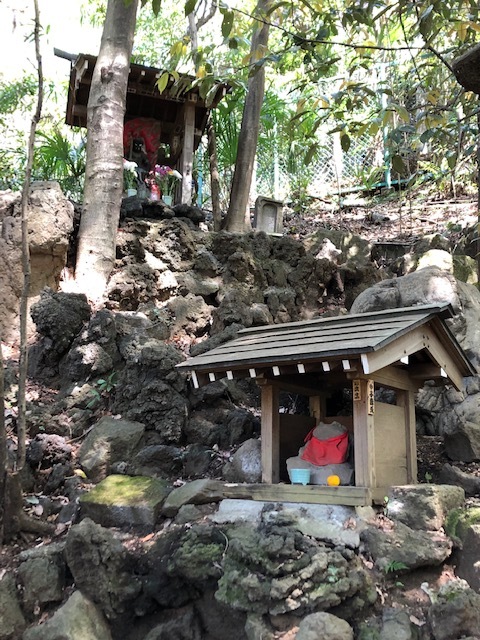 Other small shrines sat on the sides of the ravine. We discovered that there is more to the valley than just natural beauty. Along the way we came across temples and small shrines, and a steep stairway leading up to the site of some ancient tombs (which we skipped). 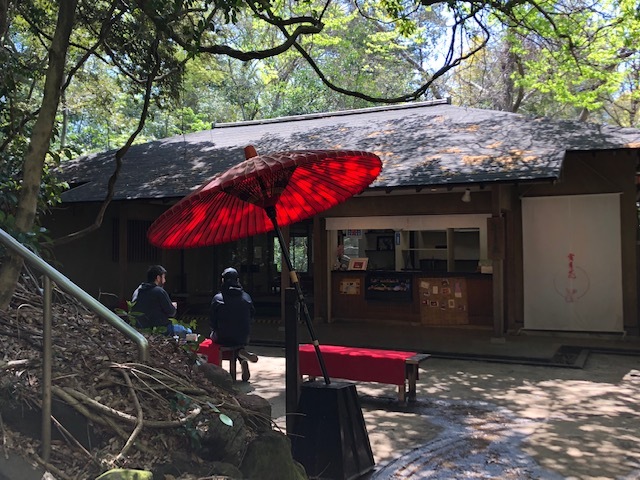 There was also a wonderful traditional tearoom called Setsugetsuka, where visitors can relax and sip green tea from pottery chawan (tea bowls), nibble on traditional sweets, and relax under the shade of a large wagasa (Japanese umbrella). Occasionally along the path were benches for rest and contemplation, and about halfway down the path was a stone seating spot where it looked as if you could dangle your feet in the water. 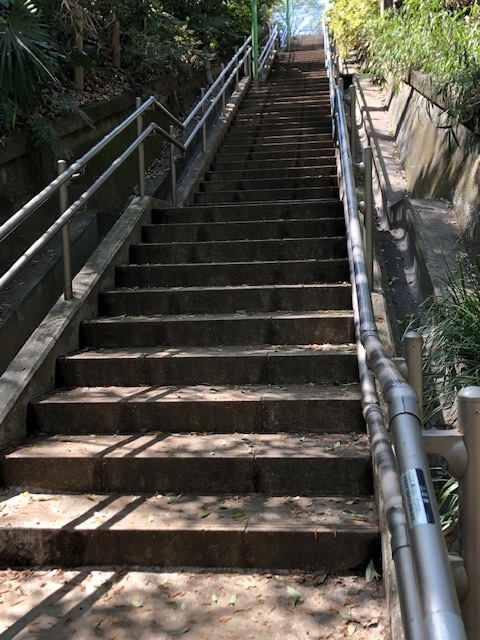 We did not attempt the five flights of stairs leading up to the ancient tombs. Towards the end of the walking path, we came across a large wooden platform on the left with steps leading up. We were a bit afraid to climb up as we thought it was part of someone’s home, but we saw others go up and it turned out to be a large platform for viewing cherry blossoms, and looking out over the park, and was attached to a lovely small temple, Todoroki Fudoson, said to be in existence for nearly 1,300 years. 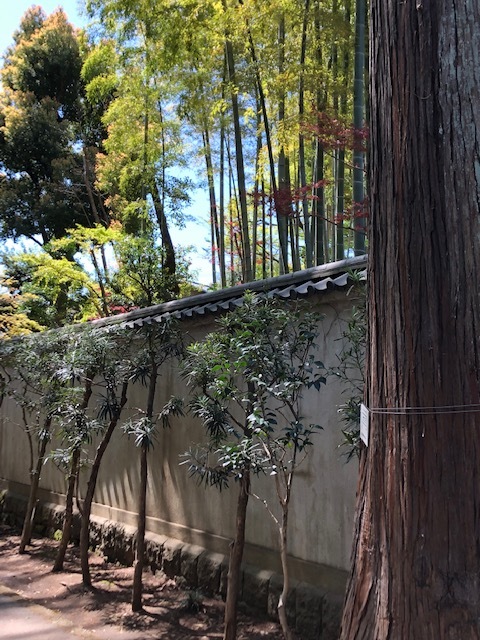 The temple grounds were filled with lush plantings of colorful spring flowers, and next to the temple we found a small ice cream shop where Brett and I enjoyed some sakura mochi ice cream while we rested and took in the temple. At the very end of the valley path was an unassuming wall and gate, the entrance to a more formal Japanese garden. 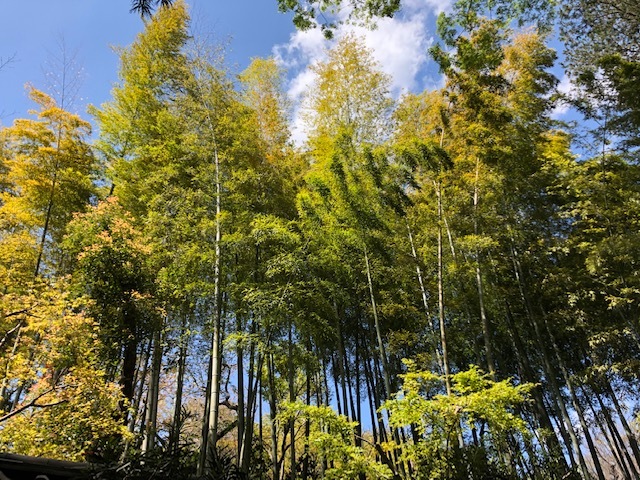 We decided not to enter, but stood outside for a few minutes to look up at a towering grove of bamboo inside and enjoy the sound of the wind blowing through the tops of the trees before turning around to head back to our starting point. 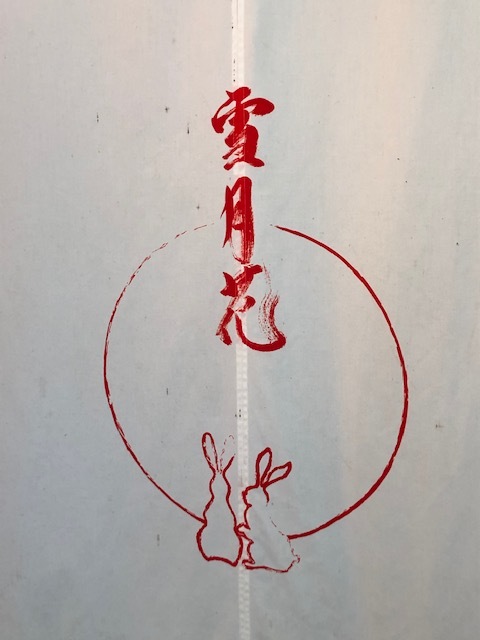 As we had some time before picking up our grandson from school, Brett and I decided to leave “the sublime for the ridiculous” and headed back to the craziness of Shibuya to visit Tokyu Hands for lunch and get Brett some calligraphy tools for practice between classes. 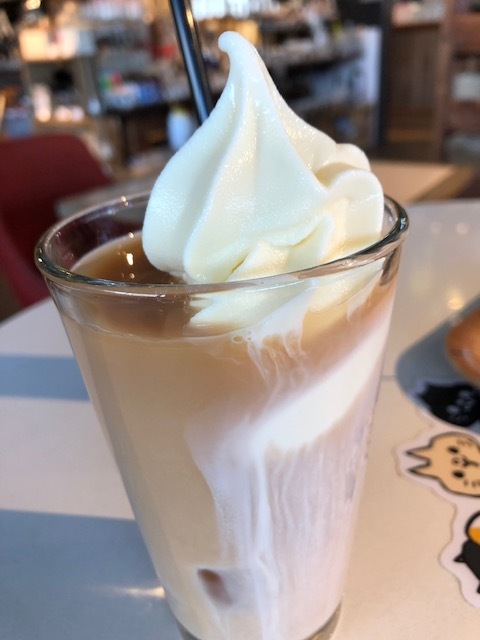 A tea float at Tokyu Hands made the visit to Shibuya worthwhile. 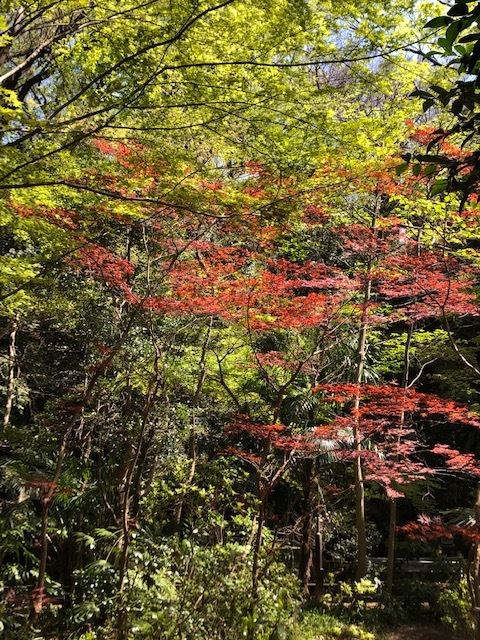 Japan never gets boring, and Todoroki Ravine Park has to be one of Tokyo’s hidden gems, a gorgeous, peaceful green space and relaxing getaway in a the hustle and bustle of an incredibly busy and crowded city. 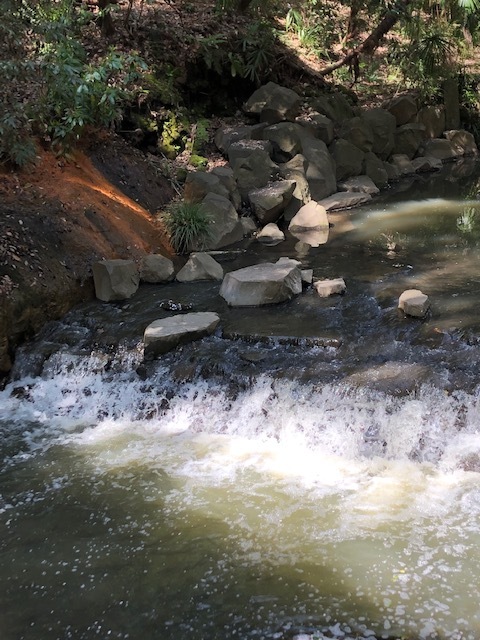 One of the many little falls along the way in Todoroki Ravine Park – a natural oasis in Tokyo. What a beautiful place. It’s impossible to imagine being surrounded by 9 million people. I hope Brett was impressed with your surprise. I would love to see this in person. It did not look crowded. Just very peaceful. My idea of heaven on earth. This park was wonderful – we really enjoyed ourselves and felt like we had gone somewhere else in Japan other than Tokyo. We heard later that the temple sometimes gets buses full of visitors because it’s considered a pilgrimage site, but it was very peaceful while we were there. What a beautiful surprise! And I’m sure Brett really appreciated the ice cream too lol. It really was a surprise! Neither of us knew what to expect, but it far exceeded anything I had hoped for. The ice cream was a treat and made Brett very happy. I think it was his first time having sakura flavor, and he liked it!